When I was in middle school, I basically came home every day and wrote for about 2 hours. In grad school, I used to write every night between 10 pm and 2 am. I didn’t really think about it; during the times in my life when I was into my work, I was into my work. When I do NaNoWriMo or go on a writing retreat, I write at least 2000 words a day, and often, many, many more. 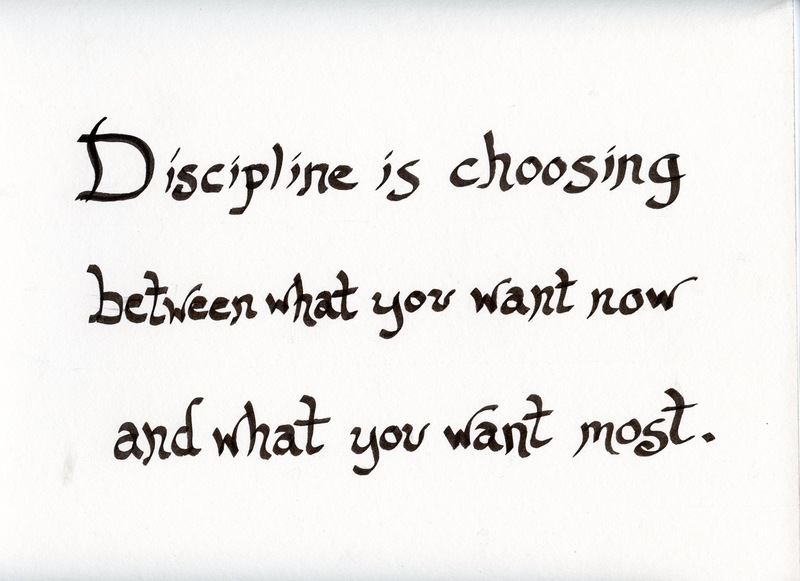 Some of us are lucky in that we don’t have to discipline ourselves too much: the thing we want most is the thing we want now. It’s a sign. It pretty much speaks for itself. I just lettered this sign for my darling husband, at his request. Usually, something like this would take me a couple days, and each letter would be perfectly spaced and formed, sketched first in pencil and then inked with a fine-tipped pen (but I would still manage to smear the ink while erasing the guidelines, and also get some on my hand and smudge it in the gutter). When I lettered the Robert Graves poem, it took me about a week, and I’m pretty pleased with it, but it still isn’t perfect to my eye. Anyway, he said he didn’t care if it was perfect, he just wanted it done. So I just quickly blocked out approximately where the letters should go. It’s an interesting sentiment, anyway. There are times when I don’t want to draw or write, and I have to force it. There are even times when I don’t force it and just watch Netflix and maybe cry about my failure as an artist. Usually, though, I’m fairly focused on my goals. When I decide to write 50,000 words in a month, or cut out carbs, or clean my office, usually I can just do it. A quick Google search attributes this quote to a psychologist named Augusta F. Kantra. This entry was posted in lettering and tagged lettering, letters, words, writing on July 22, 2014 by littledragonblue.